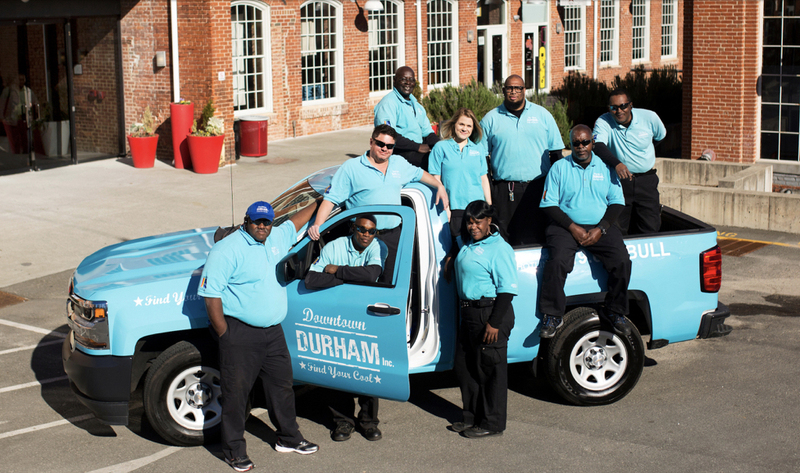 Downtown Durham has a dedicated team of Ambassadors who provide much needed clean and safe services. From sweeping and cleaning the streets, to providing directions for visitors, to jumpstarting car batteries, our Ambassadors are here to help. Have questions? Just stop one and ask. Need to submit a service request? Call 919-682-BULL (2855) or submit online. During operating hours, calls to the Ambassador Hotline will be forwarded directly to an on-duty Ambassador. You can also report concerns through our Service Center. If a request should be handled by the City of Durham, the Ambassador will submit the work order through Durham One Call. For any emergencies, please call 9-1-1. Ambassadors are on duty throughout downtown six days a week (Mon-Sat), with rotating shifts and zones, and coverage on most days from 7am-10pm. The Ambassadors also assist with special events and projects. And more. Call (919) 682-2855 for assistance.